SeniorsAloud: WANNA LEARN TO PLAY THE UKULELE? WANNA LEARN TO PLAY THE UKULELE? If you are a senior, and have never taken music lessons before or learned to play a musical instrument, and would like to start now, a good choice would be the ukulele. It is a humble little instrument that can provide hours of entertainment and joy for those playing it and those listening to it. It stimulates brain activity, and helps in reducing the risks of depression and dementia. It is a great stress-reliever. Playing the ukulele and singing along makes you feel happy. It improves coordination of your finger movement, and helps with exercising the muscles of your fingers and wrists. 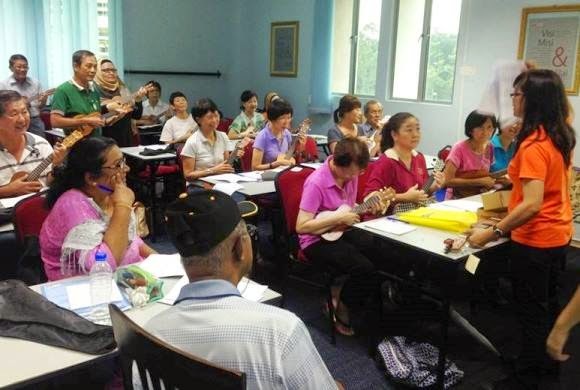 A popular ukulele class for seniors at the University of the Third Age (U3A), Malaysia with instructor Kelly Teh. The ukulele is simple to learn. Only four strings, and a small number of chords to learn. It is versatile. After a few lessons and constant practice, you can play hundreds of tunes from Old MacDonald's Farm (to sing along with your grandchildren) to evergreens like Somewhere Over The Rainbow (to sing along with your friends), and all the genres in between (e.g. hymns, classics and chart-toppers). It is light and small, and therefore portable. You can travel with it anywhere you want. Finally, and what is music to our ears - the price. It is easily affordable. If you enjoyed this simple tune played by Adam Sandler on the ukulele, click here for a tutorial on how to play it. SeniorsAloud was at The Cathay Ukulele Party yesterday evening (Sat 8 Nov, 2014). The highlight of the evening's program was when well-known ukulele virtuoso from Hawaii, Kalei Gamiao, took the stage. He was totally awesome, and his playing was literally electrifying. Check out his many videos on Youtube, and you will see why the crowd loved him. Kalei Gamiao mesmerized the crowd with his incredible jaw-dropping ukulele skills. With his eyes closed and a smile on his face, he truly seemed to be in bliss while playing. No wonder he says the ukulele is an instrument to spread peace and joy. He was also in Kuala Lumpur in June to give some concerts. Click here to read. Tom Low, 75, and his group Uke Jammers had fun playing a cover of Cliff Richard's 'The Young Ones'. 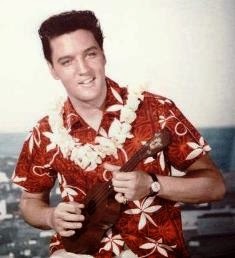 Note his special ukulele. "Only 100 such ukuleles in the world," he tells SeniorsAloud. (Below) The crowd at the event jamming and singing along. There is a huge revival of the ukulele as more and more people from 8-year olds to 80-year olds take to the instrument. Ukulele sales have soared, and music studios are now offering ukulele classes aside from the usual piano and guitar classes. 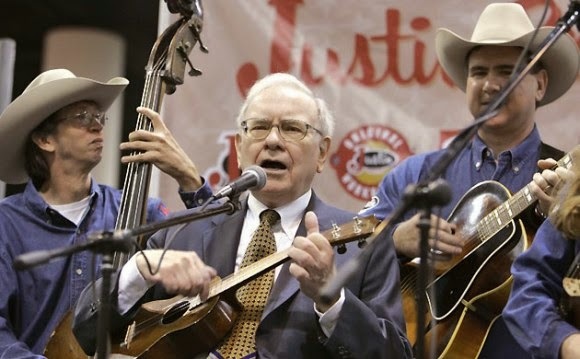 Did you know that Warren Buffett plays the ukulele too? He started playing it during his college days. For the beginner, there are plenty of ukulele tutorials you can view on Youtube. Here's one that we have subscribed to. You can search for others that suit your particular music taste. For Singapore, contact The Ukulele Movement at 178 Race Course Road, Singapore 218608 (nearest MRT Farrer Park, Exit F). For Malaysia, contact Persatuan Pencinta Muzik Ukulele Malaysia at ppmum2013@gmail.com. HOW AGE-FRIENDLY IS OUR CITY?